So I wanted to study RF. To start with the most basic I wanted to build an oscillator. All the places were full of fancy and hard schematics. But to understand the need for good we must try the worst. The simplest and worst oscillator seems to be Schmitt trigger one. Information on in is scarce, but there is some information about it in AN-118. The idea of circuit is that inverter with schmitt trigger input feeds into its own input through RC circuit. Frequency is dependant on selected R and C values. I used 74HCT1G14 inverter 1 nF capacitor and 100k 25 turn trimmer. All the signals looked fine on the oscilloscope, so I started to increase the frequency to see how far can it go. Datasheet says that rise time is about 5 ns. That should get up to 100 MHz output. However I'm only able to get about 75 MHz out. The more frequency goes over 10 MHz the more the output looks like sine wave and the less like square. But we still don't have answer why is it so bad. Signal looks okay on the oscilloscope. Time to get out "spectrum analyser". It is a DVB-T dongle with GNU radio software from computer side. Quick look on the waterfall display shows how awful the signal is. 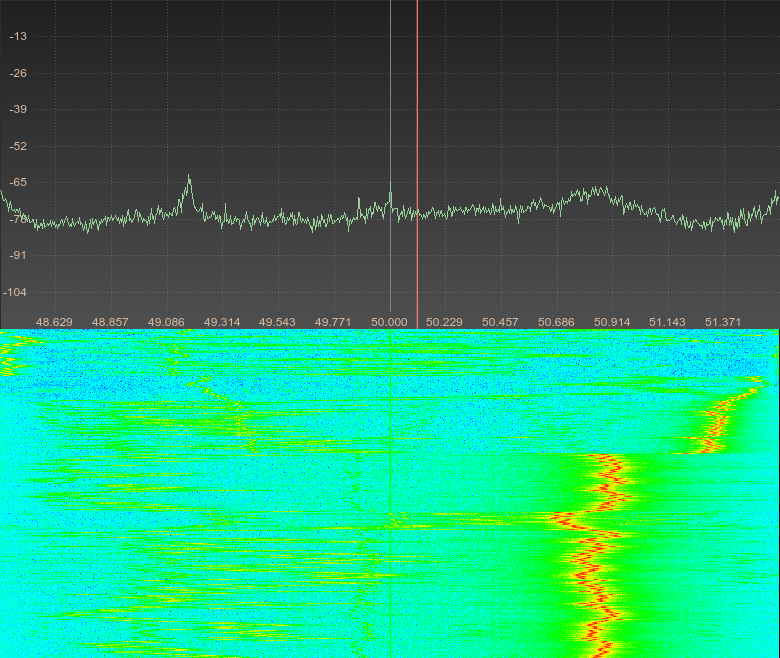 To give perspective - the whole frequency band I was targeting is 50 - 52 MHz. The part on the top where the signal is weird is part where I switched off the power. Have you tried connecting a second Schmitt trigger to the output of your oscillator? That should give you a clean square wave again. It would. In this post I tried to use it for RF generation so sine like signal was my goal. I also found out what I wanted - why is this way of making oscillator so horrible.